It was exactly sixteen years ago today that the "impossible" happened in Sierra Leone. 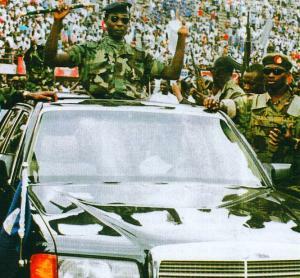 On April 29, 1992 a certain little-known Captain Valentine Strasser in a voice that was as emotional as it was agitated, told national radio and the world's watching media that the more than six year old regime of President Joseph Saidu Momoh had been overthrown and that the soldiers were now taking over the administration of the country. News of the overthrow was received with disbelief, but as it sunk in, there were spontaneous scenes of jubilation all over the country as many realised that for the first time in the 24-year history of APC-entrenched rule, that government had at last been kicked out of power. Getting the APC out had been a terrible journey. Political opponents were either murdered, jailed, harassed, tortured or forced to flee the country as thugs parading under the Youth League and calling themselves "comrade" gave free rein to all those who were willing and able to kill and maim perceived opponents of the regime. Come general elections and nomination days were a chapter in the history of violence in the country as whole swathes of territory were declared no-go areas to those suspected of supporting political opponents of the party. Those who witnessed nominations in certain parts of the country could still recall the movements of party thugs in hundreds of trucks from one area of operation to the other and woe betide any who dared to cross those lines demarcating the Mile 38 and Mile 47 areas!! In a situation where the justice, police and military apparatus had been compromised with the armed forces actually involved in the planning of violence, one could only imagine what could have happened to those who actually believed that the APC was interested in the rule of law and human rights. Political opponents were not given any breather even after such violent-encrusted nominations/elections. Those who dared to take election petitions to court were forced to abandon any hope of receiving anything akin to justice as deals were struck and favoured judges got appointed to preside over sensitive matters. It was in this atmosphere that the level of corruption reached such a peak that even to this day, many in government service see corruption as an integral part of their work. The then State House and the seat of corruption did not only witness the scenes of seedy and shady deals, but it was within the halls and offices of this institution that for the first time one Head of the Civil Service and Secretary to the then President institutionalised corruption. Postings to "lucrative" areas were based on what was contained in the brief cases that were presented to then Secretary to the President. One eye witness spoke about a meeting at the Riverside Drive residence of that particular man, the Secretary to the President that is. As usual a number of the top civil servants working in the regions had just come to town with their train of gifts in both cash and kind and after the first batch had felt after courtesies, the wife was heard to comment on the ungrateful attitude of one of the civil servants who could not cough up enough and who was always shying away from visiting their home while in Freetown. Another who had brought the first cordless telephone for his boss left later with a promise to do more in certain areas after he was criticised for not doing enough. It was this apple-cart of corruption and graft that Strasser and his men briefly upset by their bold and rather unexpected move. APC ministers who had been told to report to the new men in power did so and were subsequently released after confirmation of names and addresses. One of them, the then Trade Minister who went as far as to have his name on the USAID PL480 programme rice component, a certain Ben Kanu was heard telling neighbours of his disappointment as "men whom he had put into the military displayed such gross lack of respect and gratitude" as he found his "castle" in Tengbe Town looted. Three days later they were all arrested and detained at the then maximum security prison at Pademba Road. April 29 would always be a watershed in the political fortunes of some echelons of the APC party and demonstrated that a people pushed against the wall have no other course open to them but to come out fighting. The effects of April 29 are still being felt by those who fed fat on the country's wealth and resources while the poor continued to wallow in the filth and mud of poverty and deprivation. Party cadres who had hoped that the multi-party election promised by President Momoh would see them having their turn in the feeding frenzy queue have still not fully recovered and indeed could be the reason why some of them joined the ranks of the AFRC/RUF coalition of evil in the hope that at last they would sink their fangs into the nation's coffers. A number of party operatives who had led the high life visiting any country of their choice, massaging overseas bank accounts and selling off whatever national property/treasure that came to hand with impunity saw the April 29 action as what finally stopped the gravy train as the unlimited supply came to an abrupt end. Some, the cunning ones like Abass Bundu, sat it out and plotted accordingly and in the fullness of the clock joined the Strasser gang with whom many had now become disenchanted as they openly courted the corrupt and amassed their own piles of fortune. Abass Bundu, Dr, to give him his due title eventually became Foreign minister despite warnings to the Strasser gang that they could be treading dangerous waters. But by then, Strasser and his men including Chief Secretary of State John Benjamin had become too corrupt to hear the pleas and cries of the poor and Bio's attempt to extend the life of the military government met with such resistance from civilians that he was forced to yield. Of course there were those within the military who wanted to continue. Such was the temptations of power and wealth and these included the likes of Tom Nyuma and a young man called Idriss Kamara who had by then become a colonel in the Armed Forces of the Republic of Sierra Leone. The April 29 mutineers could have later metamorphosed into what they stated they were fighting against - poverty and corruption - but the history books will never ignore the lessons of April 29 nor the human rights abuses and atrocities committed by them and under their name. (This article was first published on April 29, 2009.